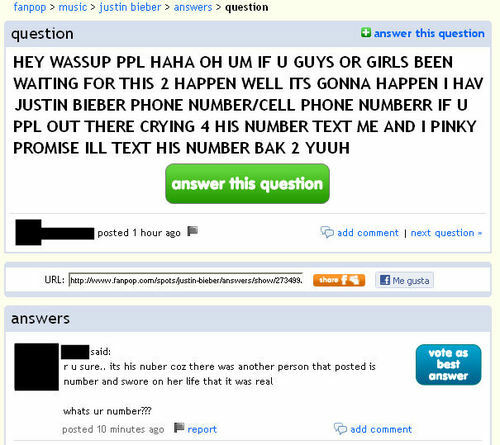 JB's phone number, yay!. . Wallpaper and background images in the fanpop FAIL! club tagged: fail justin bieber phone number yeah right sure facepalm grammar and spelling fail. Justin Bieber fans are terrifyingly short on braincells. There's been too many questions like this. ^I'm afraid all these other JB fans that have no brains are overwhelming all the intelligent JB fangirls my dear. Their desperation is hilarious. "PLZ PLZ PLZ!" and i would consider myself a very intelligent person, Shadowmarioking, InquisitiveOwl, surprisingly enough. i like jb and his music he's very cute but people take things to far, he's with Selena, duh!